Fits openings 29.5" to 50" wide. 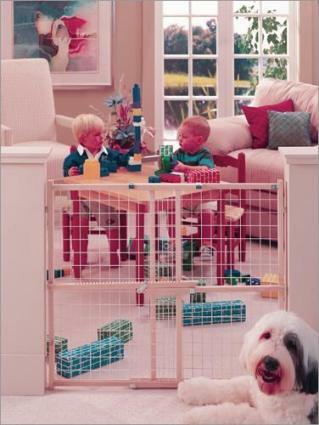 Perfectly functional, durable and easy to use, this gate is ideal to keep the kids in or out! No hardware needed, and instantly sets up in any doorway under 42" wide. This gate is perfect for any room in a house or an apartment. Extra-tall 32" high gate fits openings 29.5" 50" wide. Pressure-mounts instantly, securely without hardware. Simply position and lock in place. Sturdy hardwood frame with rigid vinyl-coated wire mesh panels and no-mar rubber bumpers. Gate width is adjustable 29 1/2" – 50"